When one or more teeth are missing, a dental implant may be the best option for replacement. Dental implants are metal or plastic cylinders that are placed into the jaw bone to serve as "roots" for the prosthetic tooth (restoration) that will function as a natural tooth. Dental Implants are often favorable, because they prevent further bone loss in the area where the missing tooth once was. They also function better than other tooth replacement options, such as a bridge or partial, and are easier to keep clean. Replacing a missing tooth with a dental implant will essentially give you back the tooth you once had, and it's relatively simple procedure. We place and restore several implants, and felt it may be helpful to provide a general outline on how dental implants work. Keep in mind different circumstances call for different actions, and this is basic overview. Initially, we will evaluate the site or area where we are planning to place the implant. It's important we have enough bone and a healthy ridge to support it. If the tooth is still there, but no longer healthy enough to save, we will remove it and fill in the extraction site with additional bone. Sometimes we're able to immediately place the implant after removing a tooth, and other times we wait 8-12 weeks for the bone graft to further evolve. Once the site is deemed "stable", we will place the implant into your bone and cover it with a healing cap. This visit will last 30-60minutes and most patients are comfortable with local anesthetic alone (sedation options are available). Once completed, we wait 12 weeks to allow the implant to "fuse" to your bone and become solid in your jaw. After the 12 week waiting period, an x-ray is taken of the site to confirm successful "fusion" between the implant and the bone. Once confirmed, we will proceed with the restorative phase of treatment. First, we will remove the healing cap, and replace it with an abutment or implant post. 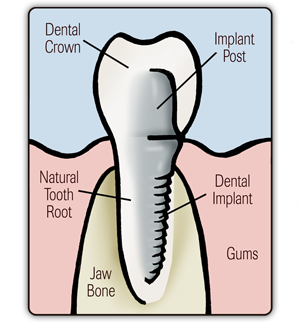 The abutment is the "link" between the implant and the crown. It screws into the implant and sits above the gum line, providing a "seat" for the final crown. We then take an impression of the abutment and send it to a dental laboratory, where they will fabricate your custom implant crown. Roughly two weeks later, your final crown will arrive from the lab. You will be seen to seat your crown and minor adjustments may be made to your bite. Once completed, the site where you were once missing a tooth will now have a strong, healthy, independently functioning restoration that looks and feels like a natural tooth. Dental implants have a tremendous success rate, and have become increasingly popular. Dr. Jessica Emery and the team at Sugar Fix Dental Loft place and restore dental implants, in cases ranging from a single tooth to multiple teeth. Dr. Emery works closely with our surgeon to ensure optimum results and uses her cosmetic and restorative dental expertise when finalizing the case. If you're interested in dental implants, or cosmetic and restorative dental services, contact us today to schedule a consultation with Dr. Emery and the team of professionals at Sugar Fix Dental Loft.